Once commissioned, the OPV would ‘significantly’ enhance the coastal patrolling capabilities of Indian Coast Guard. Larsen and Toubro (L & T) launched the lead Offshore Patrol Vessel (OPV) of a series of seven OPVs for the Indian Coast Guard on October 27. The vessel, designed entirely in-house, is the first OPV class vessel for the Indian Coast Guard built by a private sector yard in a record time frame. 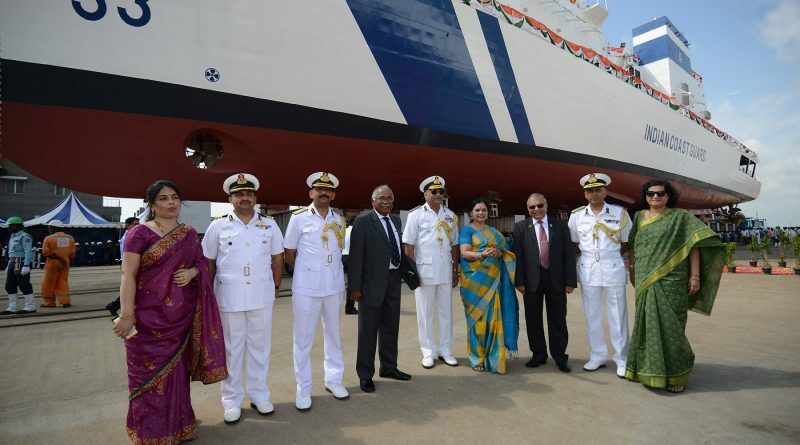 The OPV was launched by Jyoti Murthy and was named Vikram in the presence of Additional Director General of Coast Guard, VSR Murthy, PTM, TM, Whole Time Director (Defence Business) and Member of Larsen and Toubro Board, JD Patil, Vice Admiral B Kannan (retd), MD and CEO L & T Shipbuilding, and others. The Ministry of Defence entrusted L&T in Mar 2015 to design and build seven OPVs for an order value of rupees 1432 crores. The order stipulated delivery of the first OPV within 36 months from signing of the contract i.e. by Mar-2018 and subsequent vessels at intervals of 6 months. However, with the construction of multiple OPVs progressing on or ahead of schedule, all are planned to be delivered ahead of the contracted delivery dates. OPVs under the project are long range surface ships, capable of operation in maritime zones of India, including island territories with helicopter operation capabilities. Their roles include coastal and offshore patrolling, policing maritime zones of India, control and surveillance, anti-smuggling and anti-piracy with limited wartime roles. The 97m long and 15m wide vessel has 3.6m draught, 2140 T displacement with a range of 5000 NM and is built for attaining sustained speeds of up to 26 knots. The entire design and construction processes have undergone dual certification from American Bureau of Shipping and Indian Registrar of Shipping and the project is being overseen by the Indian Coast Guard’s resident team at Kattupalli shipyard. Built with modern methods and build strategy of construction on land and launch through ship lift, on launch the OPV would be put through a series of Harbour and Sea Acceptance trials before delivery to the Indian Coast Guard. Once commissioned, it would significantly enhance the coastal patrolling capabilities of Indian Coast Guard. Speaking on the launch, CEO and Managing Director, Larsen and Toubro, S.N. 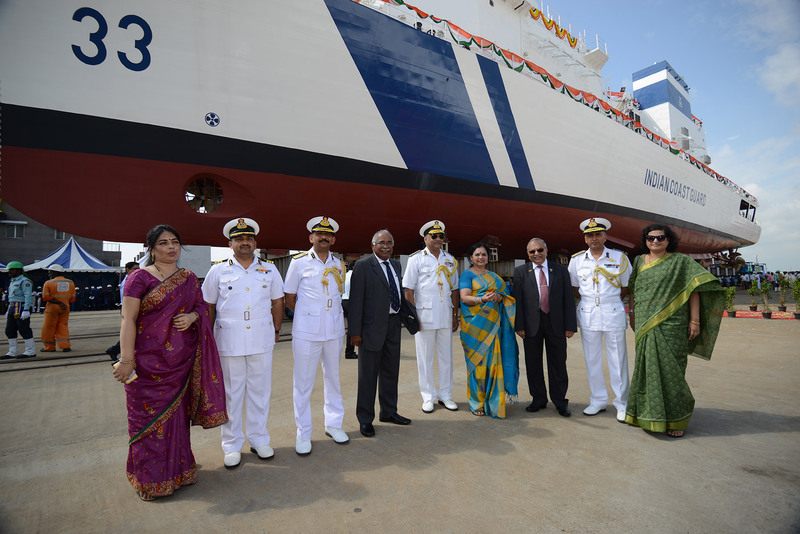 Subrahmanyan said, “This launch is a reaffirmation of our credentials in the ship building space as this is our third major mandate form the Indian Coast Guard under relationship that began with a contract for 36 Interceptor Boats followed by a repeat contract for 18 more Interceptor Boats”. He further said, “It is also heartening to note that our team has overcome all challenges to remain ahead of contractual schedules for all the mandates. 34 of those Interceptors Boats have already been delivered well ahead of contractual delivery schedule and remaining boats have been constructed and ready for delivery”. Whole Time Director (Defence Business) and Member of Larsen and Toubro Board Jayant D Patil said, “The launch of the lead OPV designed and built in-house is a big leap towards the country’s self-reliance in Defence. With a long term commitment to the defence sector, L&T has been a part of Navy’s indigenisation initiatives over the past three decades and have developed weapon systems, fire control systems, propulsion equipment and systems, engineering equipment and systems, sensors, controls and platform management systems to maximize indigenous content of our war going vessels”. Retired Vice Admiral B. Kannan, who was present during the launch of the OPV, said, “Once again, L&T has achieved the distinction of launching the lead ship of a new class of defence vessel on time. Large scale deployment of digital technologies, proven expertise in complex project management, maximization of indigenous equipment and systems, and a rich pool of skilled human resources have enabled construction on schedule”. 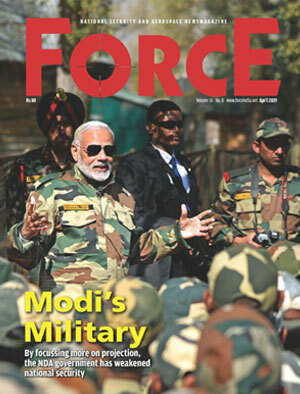 He added, “This reaffirms L&T’s capabilities to execute and deliver complex Defence projects on time using Indian design, indigenous technologies and construction skills”.